Beril #Schwartz did not immigrate. Beril's daughter Pinie, my great grandmother, did leave Botosani and lived in Montreal with her husband Jacob #Goldberg and their 8 living children. She had 4 step-siblings, children of her father and his second wife Esther. Aunt Minnie, Pinie's youngest child, Minnie Goldberg Zelman called them Yenta, Yankel, Bentsine and Schloyma. All 4 immigrated to Montreal. had written to her granddaughter in a " A Grandparents Book" that she knew her mothers' 3 brothers and one sister. "My first home that I remember was on St George St, a second storey cold flat. My Uncle Bentsine/Benjamin and his family lived downstairs. My best friend was my cousin Esther Schwartz. My mother's sister Aunt Yenta, had 5 daughters, some were about my age. I loved to spend time at their house." I have been on a quest to find out about the Schwartz family, their families and their lives. Beril and Esther had 3 other children but they had died, Hana at 5 months, 14 Dec 1870, Sender at age 3, 13 Dec 1874 of angina diptheria and Rifka at 11 days, 14 Feb 1877. I was able to get many Botosani birth, marriage and death records through a project that was done in Botosani. Pictures were taken of the records and the people who coordinated this, sent them to those who paid for the digitized records. I am very curious about Pinie's step siblings. I was able to find records through Ancestry, was able to contact descendant family members of 2 step siblings, Benny and Yetta but have not been able to find real life interconnections amongst any of the descendants of the step siblings.It is such a mystery because in the early days, the families lived next to each other or very close by. All I can do is find out what I can about the individual families and hope that one day, someone will connect. The Romanian names for father Beril was Bercu, mother was Estera. Beril's father was Iancu ( Jacob) and his mother was Malca. Birth dates vary according to the records. Beril was 84 at the time of his death, 24 Oct 1910 so that would mean he was born in 1826. What is particularly significant about his death record is that one of his sons was a witness. The name was translated as Solomon Sfartz , age 31. This would mean that Schloyma was the last child to immigrate. It was daughter Yetta and her family that I first found out about. Later from her Botosani Birth and Marriage Records, I was able to learn more dates. Yetta was born 24 Aug 1874 in Botosani. She died 5 Jan 1940 in Montreal. Her name in her Botosani Marriage Record was Enta. Her husband Kopel Moshe's family name was also Schwartz. I don't know if there is any relationship. His parents were Yaakov and Sura. Their 3 Dec 1898 Marriage Record has his name as Cohos and his age as 25, so he was born in 1873. He died 8 Apr 1964 in Montreal. Yetta and Kopel had 7 children. Esther Schwartz, born 1900, died 18 Aug 1987 in Montreal. Esther married Max/ Michal Metalin Metallin/ Mettarlin, a milliner and manufacturer. He was born about 1898 in Ostropol and died 7 Jun 1950 in Montreal. Esther and Max had 3 children. Gerald was born 24 May 1919 and died 21 Nov 1983. He married Sara was born 13 Feb 1921 and died 14 Oct 1983 in Montreal, Quebec. Gerald and Sara had one child Samuel Bernard Metallin, a financial analyst, born 1947. Ethel, second child, born 17 Apr 1924, married Bill. Katie Schwartz, according to her gravestone, was born 14 Feb 1909 and died 13 Feb 1988 in North York, Ontario. Her Hebrew name was Ayga. Kate married Max Leibovitch 31 Aug 1940 in Montreal. Max/ Menasha was born 12 Dec 1909 in Montreal and died 15 Jan 1997 in North York. Katie and Max had one daughter, Evelyn who married Allan Kendall, 13 Mar 1966 in Montreal. Evelyn and Allan had 2 children, Michelle ( Steven Klupt ) and Andrew ( Candace ). Lily Schwartz, born 18 Mar 1909, died 29 Sep 1994. Lily married Max Neiss 25 Dec 1931. Max was born in 1903 in Ostropol, Volynnia, Russia and died 29 May 1960. Lily and Max had one son, Marvin , born 8 Sep 1935. He married Sylvia Levitsky, 27 Dec 1964. Sylvia was born 31 Dec 1939 in Montreal. They have 2 sons, Michael Scott, born in 1971 (Angela Wilburn ) and Mark, born in 1973. Ruth Schwartz was born 15 May 1910 and died 4 Apr 2004 in Montreal. Ruth married Kiva Kapelusz, 30 Jul 1950. Kiva died 11 Jan 1994. Ruth and Kiva had one daughter Paula who married Mark Hollinger. Al married Lily Lazarovitch. Lily was born 10 May 1918 and died 12 Mar 2006. Al and Lily had 2 children. Jerry Israel was born 8 Apr 1945 and married Harriette. They have 3 children, Mitchell, Tamara and Jeffrey. Irwin was born 1950 and married Georgina. They have 2 sons, Eli and Nigel. It was son Benny and his family that I found out about next. Benny ( Birth Record: Bentin sin Berl( son of Berl ) ) was born 18 Mar 1881 in Botosani, Romania. He died 29 Aug 1950. His obituary tells a lot about him, highlighting that he was a well-known furrier and a prominent member of the Jewish community. In 1910 he formed the firm, B. Schwartz and Sons. One granddaughter told me that her grandfather bought 2 houses in Trout Lake and one was very big. From when she was a baby until the age of 17, she spent summers from June to September there. His mother Esther died 1 Jan 1891. I was told by one of his granddaughters that he was taken care of by an older sister so that may have been Pinie, my great grandmother. 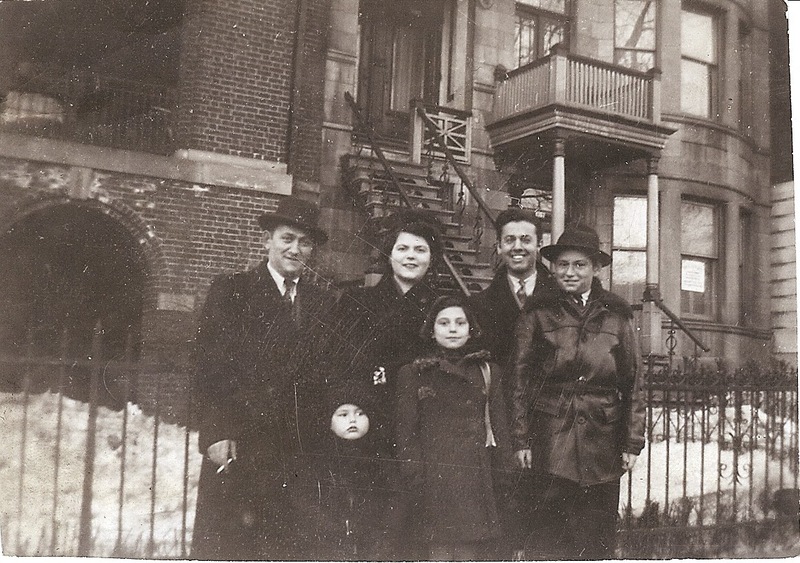 When they immigrated, their families lived in the same duplex. Benny and his family lived downstairs at 47 St George St. The 1911 Census gives his immigration date as 1901. Benny married Rose Goldberg 1 Nov 1903 in Montreal. Rose was born 10 Jan 1883 and died 12 Aug 1966 from cancer of the esophagus. Rose's mother also immigrated. Interestingly her mother's maiden name was Schwartz. Frayda Schwartz Goldberg died 4 Mar 1931 in Montreal at the age of 74 which would mean that she was born about 1857. Benny and Rose had 6 children. Abraham/ Avraham Moshe/ Abraham Moses was born 25 Feb 1906 and died 10 Jan 1987. The address of 47 St George St in his Birth Record was one of the confirmation clues that the family was indeed connected to my great grandmother's family. Abraham married Jeanne Rosenthal 2 Dec 1928 in Montreal. Jeanne/ Shayndel was born 25 Dec 1907 in Montreal and died 12 Apr 1991 in Montreal. Abraham and Jeanne had 3 children, Mildred, Barry and Gerald Michael. Alex/ Eliayahu was born 14 Dec 1909 and died 26 Nov 1988. Alex married Kate Mazur, 9 Nov 1933 in Montreal. Lester was born 14 Feb 1941 and died in 2008. Ida/ Chaya was born 25 Jul 1911 in Montreal and died 9 Mar 2009. Sam was born 29 May 1911 and died 7 Jan 1983 in Montreal. Molly/ Malka was born 3 Jun 1916 and died 6 Aug 1967 of lymphoma after breast cancer. Molly married Louis Schecter, 3 Jul 1938. Lewis was born 21 Mar 1910 and died 2 Apr 1987. Molly and Lewis had 2 daughters, Sharon Lenora and Joyce. Minnie / Manya was born 15 Feb 1918 and died 22 Oct 2009 in Montreal. Minnie and Fred had 2 children, Judah and Renee. Jacob/ Yankel/ Yaakov was Pinie's oldest step sibling. The Botosani Records identified him and his wife and their 11 children. This was remarkable because I only had his name before I received all these records. The Romanian names proved to be a challenge but gradually I found the names they used once they immigrated. The Quebec Drouin Records was a very valuable resource. The 1911 Census proved that this was indeed the family and that Jacob and his family were living at 777 Cadieux beside his brother Benny and his family at 773 Cadieux in Montreal. Jacob's birth date varied between 1858-1866 depending on the different records of his children. Since his step-sister Pinie was born after 1862, he would most probably have been born after 1862. Jacob died 26 Mar 1933 in Montreal at the age of 70 according to his gravestone, so this would mean that he was born in 1863. Jacob ( Iancu in Botosani Marriage Record ) married Malia Rotman, 22 Dec 1884 in Botosani, Romania. Malia was born about 1865 and died 6 Sep 1933 in Montreal. Malia's name was Minnie in the 1911 and 1921 Census Records and on her gravestone and Molly in her daughter Ida's Marriage Record. Ruhla/ Rachel Sfart/ Schwartz was born 16 Sep 1885 in Botosani, Romania.She is not in the 1911 or 1921 Census. I have not found the Ocean Crossing for the family so I do not know whether she immigrated with them. I have not found a Marriage Record for her. Aron Hers Sfart was born 13 Dec 1886 in Botosani, Romania and died at 17 days, 30 Dec 1886 of marasmus ( severe malnutrition ). One of the witnesses on the Death Record was his grandfather Bercu Sfarti, age 50, tailor. Mortha Sfart was born 4 Apr 1889 in Botosani, Romania and died at 14 days, 18 Apr 1889 of syphilis. Witnesses were his father, age 28, a tailor and his grandfather, Bercu Sfart, age 54. Idas Sfart ( Ida Schwartz ) was born 22 Mar 1890 in Botosani, Romania and died 8 Dec 1976 in Montreal. Ida married Israel Meyer Randolph, 28 Jan 1917 in Montreal. Israel Myer was born about 1895 in Ostropol, Volynnia, Russia and died 23 Sep 1949. Ida and Israel Meyer had 3 children. Annie was born about 1921 according to the 1921 Census. Leib Sfart ( Lorne Schwartz in the 1911 Census ) was born 29 Aug 1892 in Botosani, Romania and died 16 Jan 1959. Lorne married Rachel Ruth / Ray / Rae Levenstein, 25 Nov 1919 in Montreal. She was referred to as Rachel Gordon in her son Bertram Joel's Marriage Record, Sep 1957 in New York. Rachel's mother's maiden name was Gordon ( Rebecca Gordon ). Rachel/ Ray was born about 1895. Lorne and Rachel had 3 sons. Bertram Joel was born 12 Sep 1920 in Montreal. He married Sylvia Sawyer in Sep 1957 in New York. Ira Schwartz, birth date unknown, died 13 Jul 1934 in Montreal. Estera Sfart ( Ettie/ Attie in the 1921 Census ) / Esther ( name on gravestone ) was born 16 Jan 1895 in Botosani, Romania and died 8 Aug 1956 in Montreal. Ettie married Isidore Benderman, 9 Jun 1925 in Montreal. Isidore died 12 Mar 1978 in Montreal. Ettie and Isidore had one daughter, Rose, born 17 Jun 1926 in Montreal. Itic Sfart was born 20 Jan 1897 in Botosani, Romania and died 26 Jan 1897, at 6 days of a congenital abnormality in Botosani, Romania. Father was a witness. Malca Sfart, a twin to Feiga, was born 19 Nov 1897 in Botosani, Romania. Malca died 6 Nov 1902 at the age of 5 of scarlet fever in Botosani, Romania. A witnesss was her grandfather Bercu, age 60, a tailor. Israel Sfart was born 26 Feb 1900 in Botosani, Romania. He was in the 1911 and 1921 Census Records but I have not found anything after this date. Moise Sfart ( Morris Schwartz ) was born 1 Jan 1903 in Botosani, Romania. Morris married Bessie Randolph ( Sister to Ida's husband Israel Meyer ) 21 Mar 1926 in Montreal. Schloma/ Shloyma/ Solomon was born about 1879. He was named as son Solomon in his father Bercu/ Beril's Death Record, a very important as I then found out that he didn't immigrate until after his father died, 24 Oct 1910. In listening to the 1988 tape that was done by Mary Hearst's son with his mother and Aunt Minnie (Minnie Goldberg, youngest daughter of Pinie Schwartz Goldberg ) was when I learned that Schloma was a widower and immigrated with 3 boys. The 21 Feb 1911 Canadian Passenger Lists Arrival Record of Schloma, age 32, with 3 sons, Josel, born 1904, Berel, born 1907 and Salmon ( Solomon ), born 1908 fit the clues that I had found. However I haven't found any certain information about the family after their arrival. I'm enjoying the journey as you trace these elusive ancestors. Isn't it lucky that Aunt Minnie wrote in a "A Grandparents' Book" for future generations to know some of these details? Thank you so much for your interest!! I am so appreciative that her granddaughter asked Aunt Minnie to record her memories and that she passed that on to me!! Those clues were invaluable especially since the living descendants of those step-siblings who I spoke to are not familiar at all with those names nor of my great grandmother Pinie Schwartz Goldberg. and her children!! The challenge is to find a way to connect with more descendants to hear about their lives! Linking those addresses and where they lived so many years ago was so significant!! Israel Goldberg: What is in a Name?